Stege is an example of a classic Danish market town. It nestles around an elongated square that has roads leading into the countryside. The houses front onto the street and have long gardens behind, and a church dominates the street scene. The old market-town atmosphere still charms visitors with its well-preserved merchant's houses, town gate, town hall, pharmacy and other buildings from the 18th and 19th centuries. The town has experienced greatness: First as the centre of the herring fishing industry from the 13th century until the end of the Middle Ages. 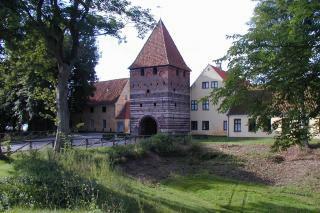 And second, when the merchant's houses from the end of the 18th century exported large amounts of grain from Møn. In 1813, Merchant Henrik Krenchel unveiled his converted Empire House. Stege already had two merchant's houses. Now Krenchel could compete with the others. But not for long. His timing was off, as the national bankruptcy hit the same year. He buckled under the pressure and was forced to declare himself bankrupt. On 20 June 1820, the assessor called to inspect and value the bankrupt estate. The once beautiful buildings had fallen into disrepair. All 15 rooms in the main building still had lovely English windows and painted panelling. But the half-timbered side buildings had seen better times. These buildings told a different story of life at the merchant's house. A kitchen, pantry, maid's room, scullery, mangle room and laundry. The assessor wrote: Note about this building: Is almost falling down." "